learned all of their manners from their father. Purchase MQR 57:6 or consider a one-year subscription to read more. 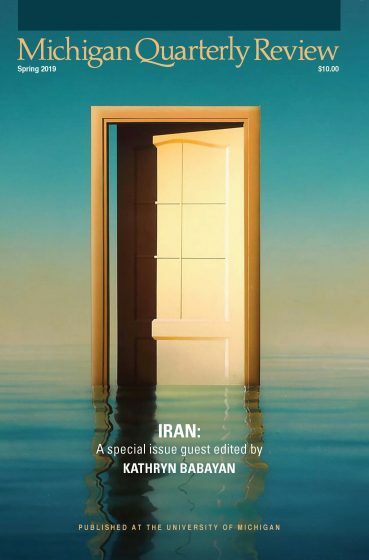 Amir Safi’s poem, “Saffron,” appears in the Spring 2019 Issue of MQR on Iran. AMIR SAFI is from College Station and is based out of Houston, Texas. He is a graduate of Texas A&M University. He is the co-founder of Mic Check, which hosts the Texas Grand Slam Poetry Festival, and the founder of Write About Now. He is a 2017 Houston Poet Laureate Finalist, a 2013 and 2015 Southern Fried Poetry Slam champion, and a 2013 National Slam Poetry semi-finalist. His work has been featured by A Plus, Upworthy, the Huffington Post, Whataburger, Total Frat Move, and others. Most recently, his work has been published by Pittsburgh Poetry Review and Tincture Journal, and he has received recognitions as a semi-finalist for the Crab Creek Review 2017 Poetry Prize as well as a finalist for the North American Review’s 2018 James Hearst Poetry Prize.